The list of publications in the public domain provides you an idea about expertise and experience Not listed are dozens of confidential reports which have been made available to customers. For those interested in a regular update of adjuvant innovations and literature references; see our digital Adjuvants & Formulations newsletter. Digital copies of the publications below may be obtained by visiting the websites of the journals. de Ruiter, H., R. van der Schoor and H. Jalink. 2004. Fluorescence imaging for investigating the efficiency of formulations, adjuvants and application systems. Journal of ASTM International, July/August 2005, Vol. 2, No.7. Paper ID JAI12159, available online at www.astm.org. De Ruiter, H., H. J. Holterman, C. Kempenaar, H. G. J. Mol, J. J. de Vlieger and J. C. van de Zande. 2003. Influence of adjuvants and formulations on the emission of pesticides to the atmosphere. A literature study. Report 59. Plant Research International B. V., Wageningen, The Netherlands. De Ruiter, H., Ribot, S. A., Uffing A.J.M. 2001. A novel triglyceride based adjuvant for bromoxynil salt. pp. 88-93 in de Ruiter, H. (ed.) 'Proc. 6th International Symposium on Adjuvants for Agrochemicals ISAA 2001, ISAA 2001 Foundation, The Netherlands. In 2001 editor of: Proc. 6th International Symposium on Adjuvants for Agrochemicals ISAA 2001, ISAA 2001 Foundation, The Netherlands. De Ruiter, H., Nijhuis, E., Wollenweber, H. W., and Mainx, H. G. 2001. 'Cellular Toxicity of Different Classes of Adjuvants,' Pesticide Formulations and Application Systems: A New Century for Agricultural Formulations, Twenty First Volume, ASTM STP 1414, J. C. Mueninghoff, A. K Viets, and R. A. Downer, Eds., American Society for Testing and Materials, West Conshohocken, PA, 2002, pp. 3-10. De Ruiter, H., Downer, R. A., Uffing, A. J. M., Ebert, T. A., Pikaar, P. J. J., and Hall, F. R. 2001. 'The Influence of Inorganic Cations on Glyphosate Activity- Review and Perspectives,' Pesticide Formulations and Application Systems: A New Century for Agricultural Formulations, Twenty First Volume, ASTM STP 1414, J. C. Mueninghoff, A. K Viets, and R. A. Downer, Eds., American Society for Testing and Materials, West Conshohocken, PA, 2002, pp. 23-36. De Ruiter, H., A. J. M. Uffing, and N. M. van Dijk. 1999. The influence of growth stage on the glyphosate dose needed for weed control. Proceedings 1999 Brighton Crop Protection Conference. pp. 615-620. De Ruiter, H., H. G. Mainx, H. W. Wollenweber, A. J. M. Uffing, and J. C. M. Withagen. 1998. Phytotoxicity of different classes of adjuvants. Proceedings Fifth International Symposium on Adjuvants for Agrochemicals, Ed. P. McMullan. pp. 204-209. De Ruiter, H., E. Meinen, S. A. Ribot, and A. J. M. Uffing. 1998. A new approach for monitoring the influence of adjuvants on glyphosate transfer from drop deposit to sink leaf. Proceedings Fifth International Symposium on Adjuvants for Agrochemicals, Ed. P. McMullan. pp. 37-42. De Ruiter, H., A. J. M. Uffing and E. Meinen. 1998. Methodology for evaluation of glyphosate formulations. Pesticide Formulations and Application Systems: Eighteeenth Volume, ASTM STP 1347, eds. J. D. Nalewaja, G. R. Goss, and R. S. Tann., American Society for Testing and Materials. pp. 294-303. De Ruiter, H. A. J. M. Uffing and E. Meinen. 1998. Fluorescence as a tool for optimizing adjuvants. Pesticide Formulations and Application Systems: Eighteeenth Volume, ASTM STP 1347, eds. J. D. Nalewaja, G. R. Goss, and R. S. Tann., American Society for Testing and Materials. pp. 304-316. De Ruiter, H. and E. Meinen. 1998. Influence of water stress and surfactant on the efficacy, absorption and translocation of glyphosate. Weed Sci. 46: 289-296. De Ruiter, H, A. J. M. Uffing and E. Meinen. 1997. Influence of emulsifiable oils and emulsifier on the performance of phenmedipham, metoxuron, sethoxydim and quizalofop. Weed Technol. 11: 290-297. De Ruiter, H., A. J. M. Uffing and E. Meinen. 1996. Influence of surfactants and ammonium sulfate on glyphosate phytotoxicity to quackgrass (Elytrigia repens). Weed Technol. 10: 803-808. De Ruiter, H., K. R. Straatman and E. Meinen. 1996. Influence of two fatty amine surfactants on foliar absorption, translocation and efficacay of 2,4-D triethanolamine salt. J. Agric. Food Chem., 43(12): 3093-3097. De Ruiter, H. and E. Meinen. 1996. Adjuvant-increased glyphosate uptake by protoplasts isolated from quack grass Elytrigia repens (L.) Nevski. Weed Sci., 44: 38-45. De Ruiter, H.and E. Meinen. 1995. Influence of surfactant and water stress on the efficacy, absorption and translocation of glyphosate. pp. 211-216 in R. E. Gaskin, ed. Proceedings 4th Symposium on Adjuvants for Agrochemicals. New Zealand Forest Research Institute Lmited, Rotorua, New Zealand. De Ruiter, H., A. J. M. Uffing and E. Meinen. 1995. The Influence of Surfactants and Ammonium Sulphate on the Performance of Glyphosate against Elytrigia repens. Meded. Fac. Landbouwwet. Rijksuniversiteit Gent 60/2A: 191-195. De Ruiter, H., M.A.M. Verbeek and A.J.M. Uffing. 1994. Influence of ammonium sulphate and two surfactants on the phytotoxicity and uptake of glyphosate. Meded. Fac. Landbouwwet. Rijksuniversiteit Gent vol. 59-3B, pp. 1403-1408. De Ruiter, H., E. Meinen and A.J.M. Uffing. 1994. Influence of adjuvants on the efficacy of herbicides applied to plants grown indoors and outdoors. BCPC Monograph no 59: Comparing glasshouse and field pesticide performance II, pp. 245-250. De Ruiter, H. and K.R. Straatman. 1993. The influence of amine surfactant on the foliar absorption and the translocation of 2,4-D triethanolamine salt and iso-octyl ester. Pestic. Sci., 38: 145-154. De Ruiter, H., E. Meinen and M.A.M. Verbeek. 1992. Influence of the type and the concentration of surfactant on glyphosate absorption; relevance of drop spreading and drying time. In Adjuvants for Agrochemicals. Ed. C.L. Foy. CRC Press., 109-116. De Ruiter, H., A.J.M. Uffing and K.R. Straatman. 1991. The influence of three adjuvants on the phytotoxicity of phenmedipham, difenoxuron en sethoxydim. Meded. Fac. Landbouww. Rijksuniversiteit Gent. 56/3a: 863-870. De Ruiter, H. and E. Meinen. 1990. Relation between the concentration of glyphosate and its foliar absorption. Seventh International Congress of Pesticide Chemistry (IUPAC). Abstract nr. 5A-28. De Ruiter, H., A.J.M. Uffing, E. Meinen and A. Prins. 1990. Influence of surfactants and plants species on leaf retention of spray solutions. Weed Sci. 38: 567-672. De Ruiter, H., M.A.M. Verbeek and A.J.M. Uffing. 1988. Mode of action of a nonionic and a cationic surfactant in relation to glyphosate. pp. 44-54 in Pesticide formulations, innovations and developments. B. Cross en H.B. Scher eds. American Chemical Society Symposium Series 371. De Ruiter, H., J.R. Hoekstra and A.J.M. Uffing. 1987. The influence of different adjuvants on the fytotoxicity of glyphosate and fluazifop-P-butyl. Meded. Fac. Landbouww. Rijksuniversiteit Gent, 52(3b): 1217-1223. For those who want to receive an update of technical developments with adjuvants and formulations for agrochemicals we publish the bimonthly Adjuvants & Formulations newsletter. 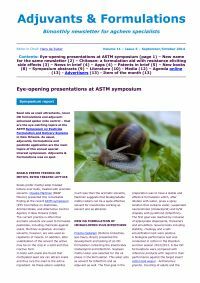 Regular items are patent updates, innovations, previews and summaries of symposia, hyperlinks to recent literature and an agenda of forthcoming meetings. A subscription is required for access to this newsletter. A free recent issue is direct available.